The best cabins for impressive views over the AquaTheater on the world's biggest cruise ship are the plush AquaTheater Suites, right? 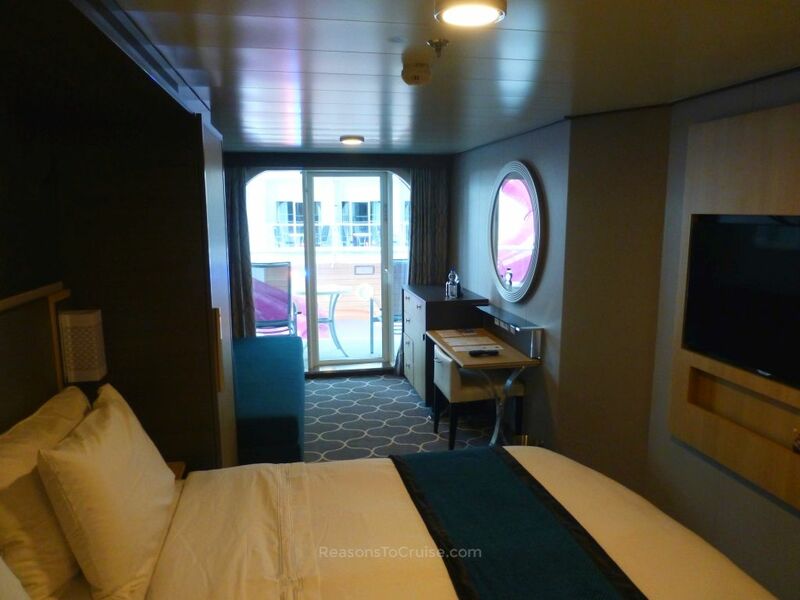 Cabin 8729 is one of the ten hidden gems on Harmony of the Seas known as Boardwalk balcony cabins. What makes cabins 8329, 8729, 9329, 9729, 10329, 10729, 11329, 11729, 12329, and 12729 particularly special are the views. Positioned at the very end of the Boardwalk they each enjoy views over the AquaTheater. The views are obstructed slightly by the 10-storey Ultimate Abyss slide but not by much at all. Cabin 8729 itself was very comfortable with room for three. A double bed that can split into twin beds dominates the room. Remove the upright cushions from the long sofa and it transforms into a third bed. A space-saving flat screen television affixes to the wall at the foot of the bed. Two bedside wardrobes provide a range of shelving, drawers, and hanging rails. A desk and chair sit in front of a circular mirror. Two American plug sockets, along with one European, and two USB sockets are just above the desk, beneath the slimline shelf. To the side sits a chest of drawers which hides the mini bar. The bathroom is spacious with a generous shower cubicle made possible thanks to a slimline sink and vanity area. The balcony is the real star of the show. It is considerably larger than I had expected, thanks to the curved glass balustrade. There is room for two reclining seats and a standard-height table, ideal for those room service breakfasts. The balcony boasts great views over AquaTheater, and along the Boardwalk towards the carousel. The shrieks from those braving the Ultimate Abyss provided background noise, as did the kids tackling the Lucky Climber below. The chimes of the carousel are also noticeable. Thankfully not all riders shriek, and some offer up amusing alternatives. Hearing "let me out" repeatedly for 15 seconds was one variation I heard. The balcony is overlooked by those staying in the cabins opposite, and with the lack of net curtains, it is easy to see sights you wished you had not. Trust me. 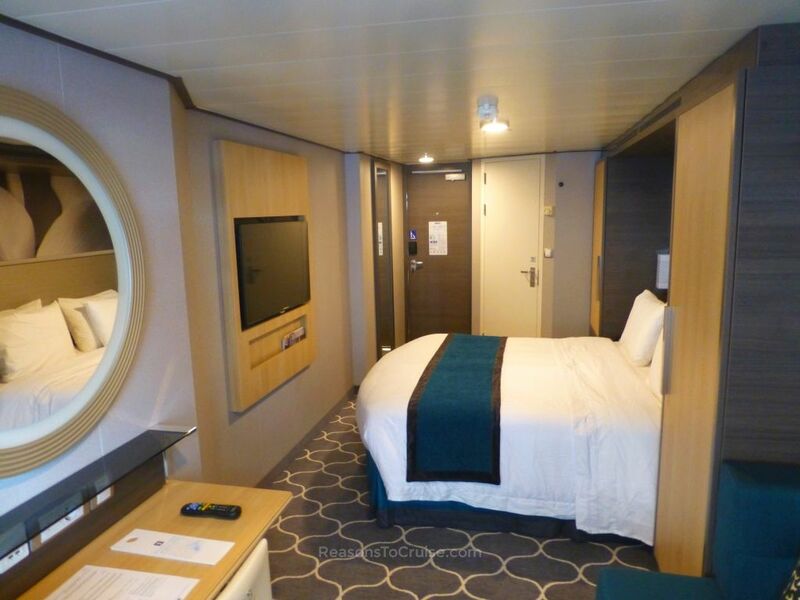 Compared to an ocean view balcony cabin you do not get an uninterrupted view of the sea. But it is called a Boardwalk balcony cabin, so you already knew that. It does at least have some form of sea view, though. The AquaTheater Suites meanwhile follow the curves of the ship and the AquaTheater itself. The huge tear-drop shaped balconies offer unrivalled views of the aquatic shows on one side and endless sea views on the other. The two-bedroomed suites include a living area, dining room, two bathrooms, entertainment centre, and a massive balcony with table and chairs. The Star Class AquaTheater Suite (not to be confused with the smaller one-bedroom, one-bathroom Sky Class AquaTheater Suite) comes with an extensive list of amenities. There is a complimentary mini-bar, speciality bottled water, a Nespresso coffee machine, bathroom amenities by l'Occitane, complimentary in-suite movies, a Duxiana mattress, and Frette linens, towels, and bathrobes. Access to the suite-only restaurant, Coastal Kitchen, and the Suite Lounge is included. There is also a complimentary fitness class, complimentary spa Thermal Room access, and exclusive access to signature activities. A complimentary Concierge service can help plan your days. Drinks keep on flowing with a complimentary unlimited beverage package, and the Internet has no bounds thanks to the free VOOM service included too. Make no mistake, if I could have afforded it, I would have booked an AquaTheater Suite for its views, convenience, space, and amenities. But based on quotes I generated, the AquaTheater Suite broadly costs three times as much as a Boardwalk balcony cabin (based on a typical Caribbean itinerary). For AquaTheater views on a lower budget then my tip is to book cabin 8729. The comfortable and affordable Boardwalk balcony cabin has none of the suite perks but it does have some of the views. If you are celebrating a special occasion, or want a very memorable and comfortable luxury holiday, then the AquaTheater Suite would be well worth the splurge. 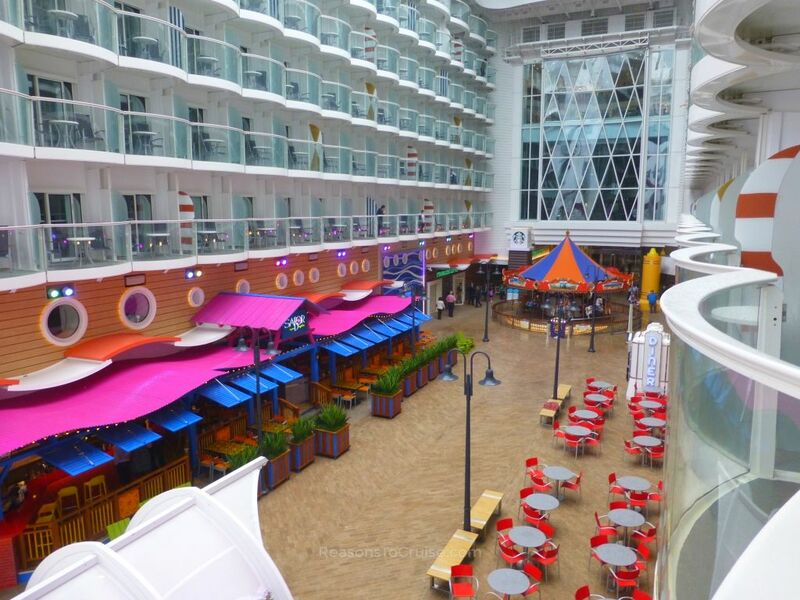 Harmony of the Seas will shortly reposition to Barcelona where she will spend her summer season sailing week-long itineraries to Palma De Mallorca, Marseille, La Spezia (for Florence/Pisa), Civitavecchia (for Rome) and Naples. Passengers preferring to visit Barcelona as a port of call can opt to board and disembark at Civitavecchia instead. On 23 October 2016 Harmony of the Seas will embark on her first transatlantic sailing with calls to Palma De Mallorca and Malaga en-route to Fort Lauderdale in Florida, USA. Here she will commence sailing alternating one-week Eastern and Western Caribbean itineraries. Eastern Caribbean itineraries will call at Nassau, St Thomas, and St Maarten, while the Western Caribbean itineraries will call at Labadee, Falmouth, and Cozumel. 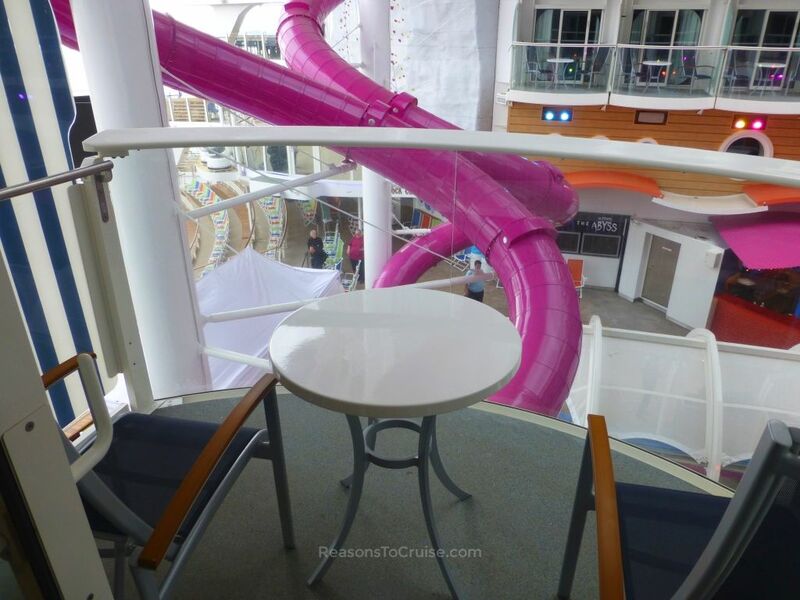 To find out more about Harmony of the Seas itineraries and prices then head here°. Would you book a Boardwalk Balcony cabin or would the potential noise and views put you off? Leave a comment below. Disclosure: I paid for this cruise holiday in full, together with transportation to and from the port. 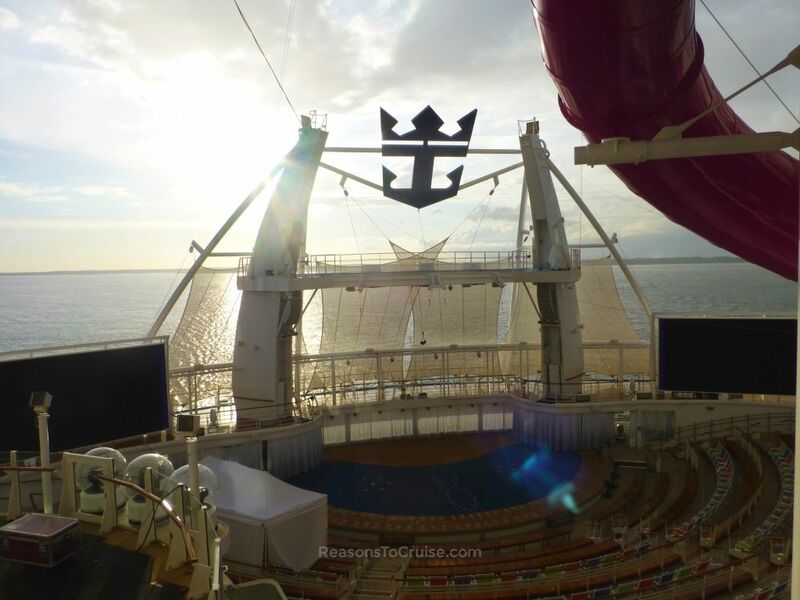 Royal Caribbean kindly supplied WiFi access, a meal for two in Wonderland, and $100 on-board credit to cover incidentals. The opinions in this article are my own. Book this cabin if you want AquaTheater Suite views on a budget. The décor was clean and modern and the cabin size was good. The balcony was larger than I had expected but lacked privacy. The noise from the Boardwalk as well as riders on the Ultimate Abyss will put some people off. Remember to factor in the hike required to reach the cabin from the facilities at the front of the ship thanks to its location at the very rear. IDK about Harmony, but on Oasis and Allure, the “AquaTheater Suites” were just public areas and could be accessed at any time of the day. 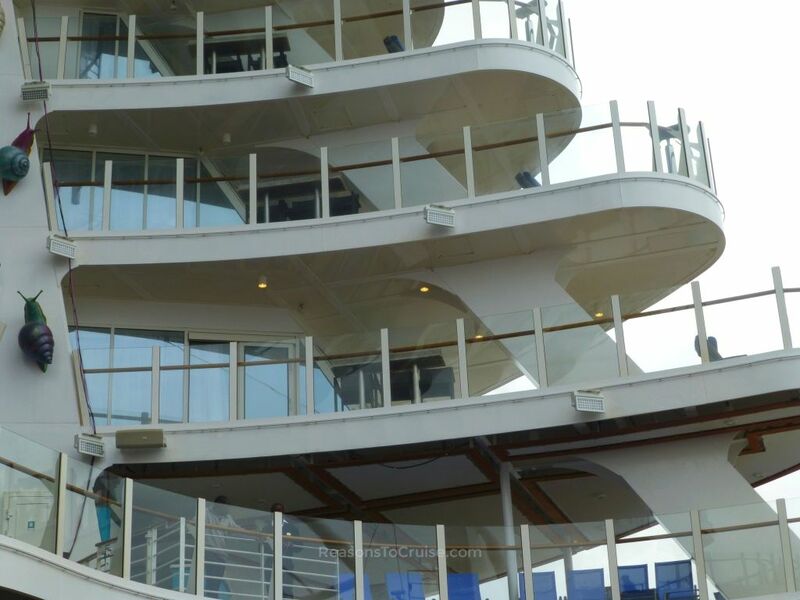 I don’t think that’s the case now – the deck plans from Royal Caribbean show suites here, although these may well have been retrofitted.